SOAPBOX CREATIONS: It's Party Time! Yep that's right! We are having a blog hop and it's FULL of party ideas straight from Clear and Simple stamps March/April release! Here is the invitation again. I used the number "1" from the Alpha Dots alphabet set and then wrote in her name with black pen. I added a little ribbon tab at the top. This is just a fun little element I used on the treat bags too! And then the cupcakes! 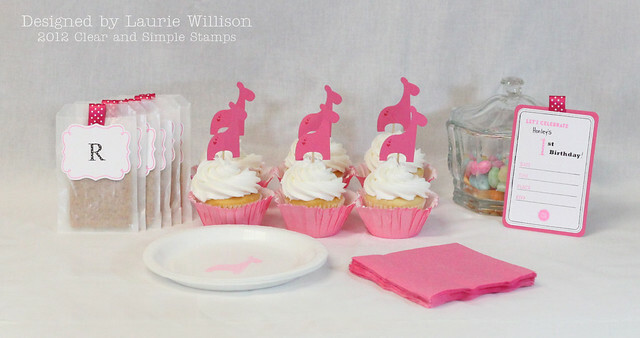 Easy to make with the die, a little heart stamp from the Baby Shower set. I just attached each to a toothpick for easy cupcake flags. I added a monogrammed label to each glassine bag, closing the tops with some pink polka dotted ribbon. The letters are from the Alpha Dot set and that gorgeous frame stamp is in the Party Elements: Baby set. Thanks so much for stopping today! Have a great day! Oh my goodness. 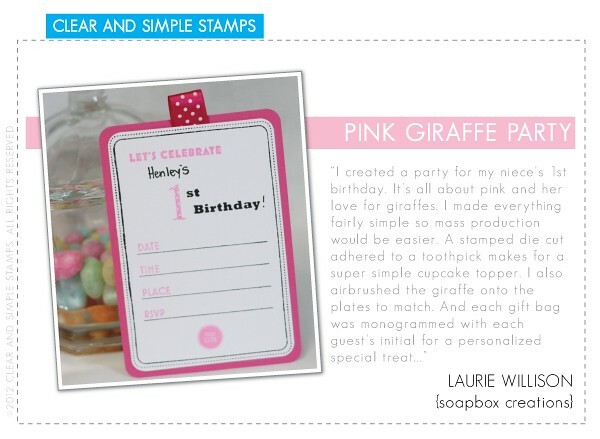 This party set is beyond adorable Laurie! I am grinning from ear to ear! 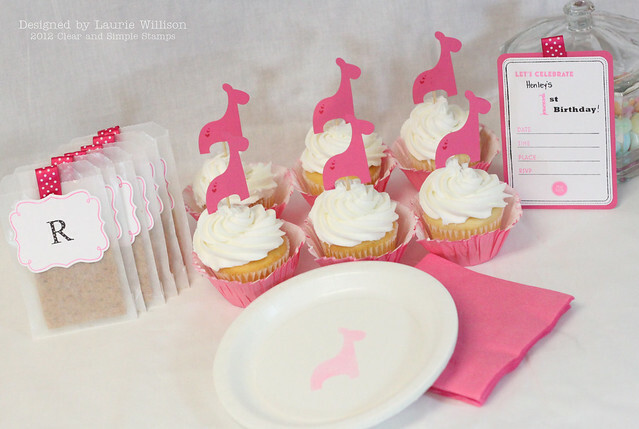 Look at those darling cupcakes and toppers. So fabulous. i love that you carried the ribbon top idea from the invite to the party favors. Those favor bags are so neat and perfect.... LOVE THAT! I love it! I do I do! I have 3 girls and this ensemble is so girly. The airbrush on the plate, well, it's awesome!!! What a great aunt you are. These are all just adorable. So cute! Love the little bags and the stencil for the plates is genius! as is the custom plates!! SO cute! 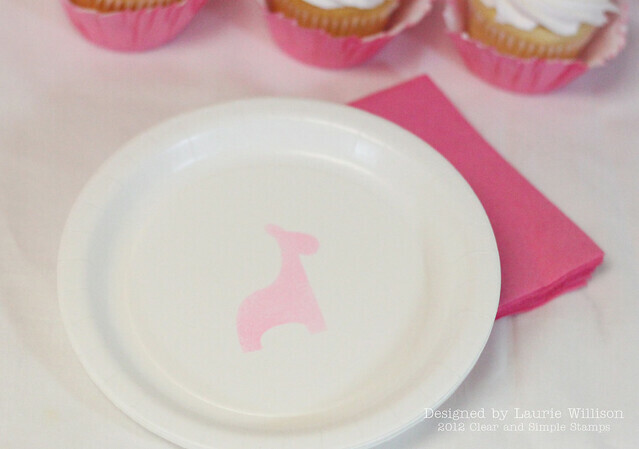 I love the bright pink and the plates are so smart! All the personalized and monogrammed touches are so sweet! This is just a sweet as can be Laurie. Those perfectly adorned cupcakes look yummy!! This is adorable Laurie! I love that you used the giraffe as your focal image, keeping it super cute but not quite as traditional as other animals! I also love the graham crackers in the glassine bags!! 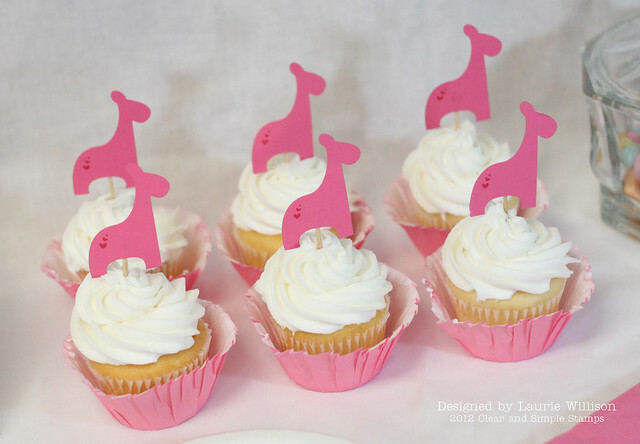 Oh my gosh- just LOVE your little giraffe cupcake toppers. Those are adorable!!! What a sweet party. Yummy pink giraffe goodness. I could just lick the frosting right now, it looks so perfectly piped! Way cute!!! 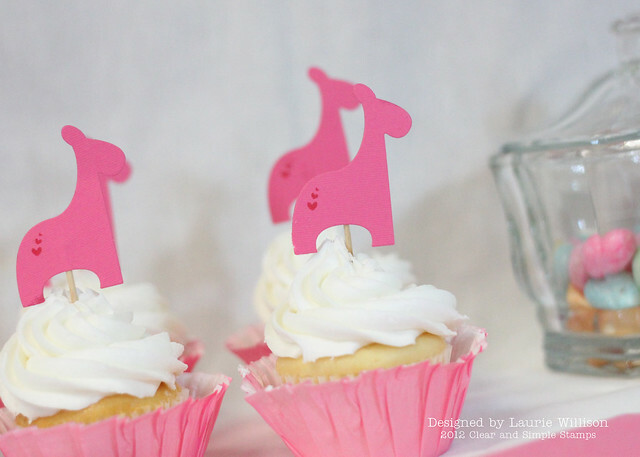 Love, love, love the little giraffe party toppers!!!! Absolutely perfect Laurie!! You are amazing! This is adorable! 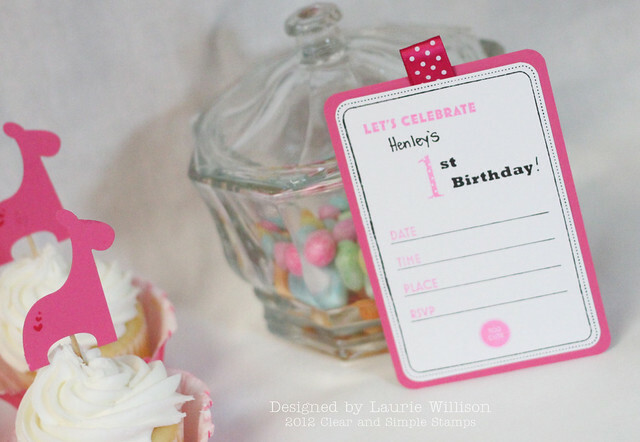 Perfect for a girly first birthday celebration! My goodness, this is the sweetest ensemble! I love all the pink, pink, pink!